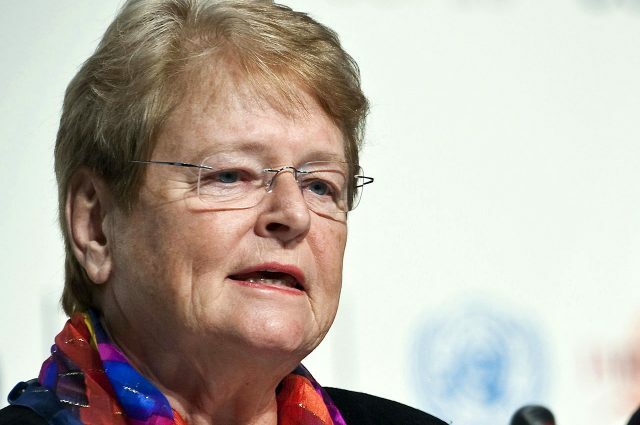 The Honorable Gro Brundtland, the first female prime minister of Norway and a former director-general of the World Health Organization, will give a talk as part of the Adlai E. Stevenson Memorial Lecture Series. Brundtland’s address, “Our Common Future: Sustainable Development and Addressing Climate Change,” will begin at 7:30 p.m. on Thursday, April 13, at Westbrook Auditorium on the campus of Illinois Wesleyan University. It is free and open to the public. There will be a master class for the University communities at 3 p.m. that same day in the Bone Student Center Prairie South Room on the Illinois State University campus. Educated and trained in Norway as a physician, Brundtland also earned a master’s degree in public health from Harvard University. She served five years as Norway’s minister of the environment before becoming the first woman prime minister of Norway. She ultimately served three terms (1981, 1986-1989, 1990-1996). In her second term, her cabinet of eight women and nine men represented the highest level of gender equality in history. The Illinois State University Speaker Series seeks to bring innovative and enlightening speakers to the campus with the aim of providing the community with a platform to foster dialogue, cultivate enriching ideas, and continue an appreciation of learning as an active and lifelong process.